When I think of Christmas at the Body Shop I remember my first purchase from the Body Shop when I was little a Christmas gift I had saved up to buy, the most amazing red foam/felt pencil case ( it was probably for makeup brushes!) with a yellow tiger stuck to the end, I also really vividly remember that It supported the World Wildlife Federation. The Body Shop are still continuing with the tradition of contributing to charity. This year their chosen charity is War Child a charity which supports education for children of war. For every Christmas gift purchased this year no matter how small a donation will be made to this charity. This spurred me to make my first purchase many years ago and definitely still sways me now. 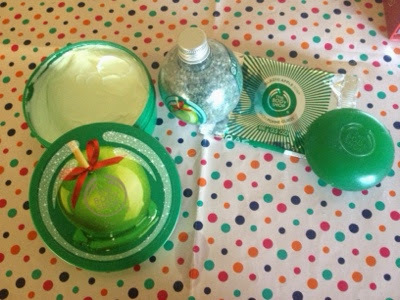 The Body Shop products are always great quality with amazing smells and this years offerings are no different. I have trialed products with the smells of Vanilla, Cranberry and Glazed Apple and can 100% guarantee that each one of them smells divine! I will start with the Schoolbook of Wishes RRP €23 this was created in honor of their children in education charity war child. 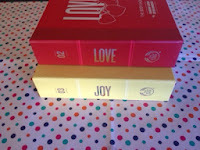 There are three books Peace (glazed apple) Love (frosted cranberry) and Joy(vanilla). 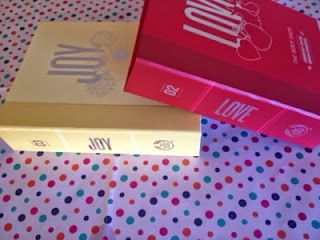 Each gift set contains a 50ml of body butter, 60ml shower gel, 20ml lip balm and a pretty heart shaped soap. What I thought was a lovely touch was the different quotes on the inside cover each relating to the specific theme of the book e.g. for joy I got a quote from Charles Dickens A Christmas Carol 'there is nothing in the world so irresistibly contagious as laughter and good humour' Its this attention to detail that makes these gifts extra special. All of the products in here are great quality and of course smell divine. They are also really good sizes for such a reasonable price. My absolute favorite from the books has to be the frosted cranberry lip balm so yummy( dont eat this please!) and Christmassy. This is the perfect gift for any lady in your life I know I would be very happy waking up to this Christmas morning. Next up Ive got some gorgeous Glazed apple goodies! The smell of these beauties is just out of this world it reminds me of the smell of apple drops but with a sort of Christmas twist. These body butter €18.95, bath sprinkles €10.95 and soap €3.95 are all sold separately but I think they make a really good gift when combined together especially if you add in one of the really cute winter animal bath sponges €3.95, the penguin in the top picture is my favorite. The body butter is really thick and creamy so luxurious and is absolutely perfect for putting on just before bed after a bath using the sprinkles......( im transporting myself mentally to such a relaxing pamper night! ) the smell is a little subtler on the skin than when you smell it out of the tub, It does manage to be just the right amount of scent neither over or under powered. The Body Shop also have a glazed apple room spray which I will definitely be buying as I cant imagine anything nicer than my home smelling like this! *I recieved these from the Body Shop as PR samples. 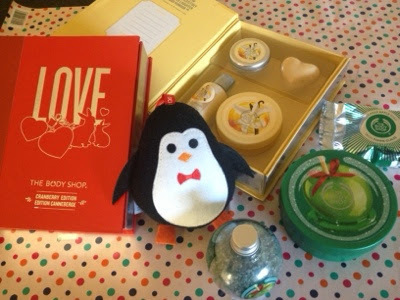 Have you got any Body Shop goodies on your Christmas list? Let me know in the comments.